Weddings guests at an Irish ceremony organised a flashmob in church for the delighted bride and groom. Bernie Gavin and Cian O'Leary exchanged vows at Castletown Geoghegan church in County Westmeath on October 27 last year. 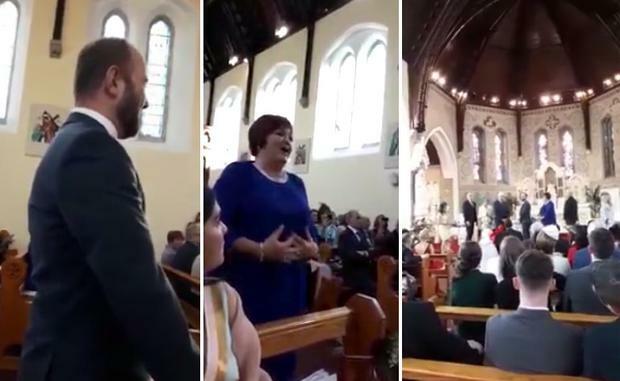 And as the ceremony progressed singer Joe McNally and John Bourke began singing The Way Old Friends do before being joined by guests Marie Byrne, Valarie Moore, Thomas Gahan and John Kennedy. They were joined towards the end by Jean Kenny and Niamh O'Shea. It was a beautiful moment, made all the more lovely with music from organist Feargus Kearney.